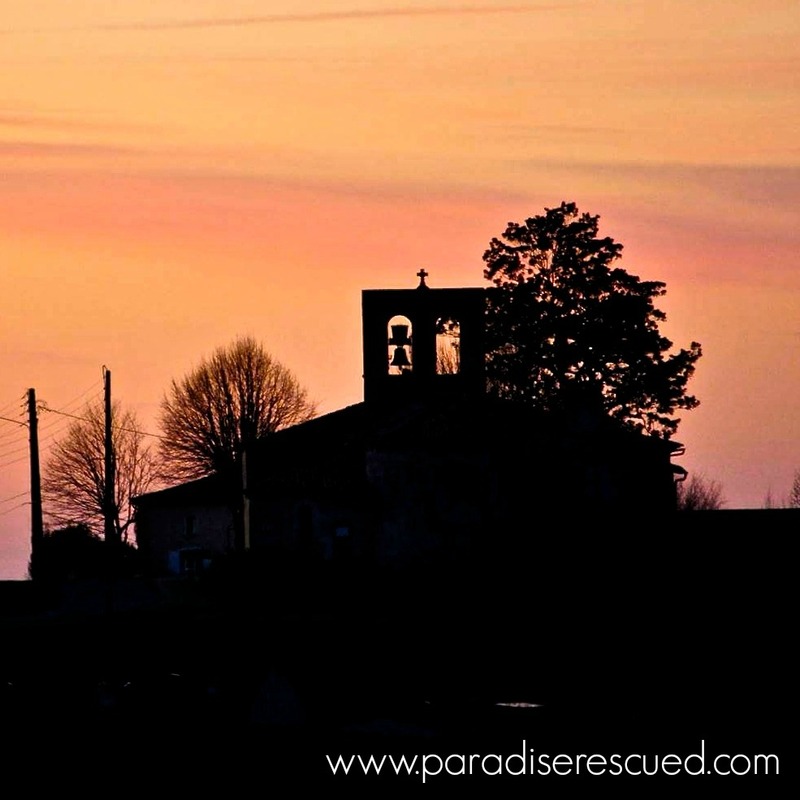 Paradise Rescued – the inspiring story that is our brand. “Trois maisons, Monsieur Stannard! trois Maisons!” (Three houses, Mr Stannard, three houses!) exclaimed Monsieur Dados dramatically as he welcomed me into his home. And all before I could barely say “Bonjour” or shake his hand. 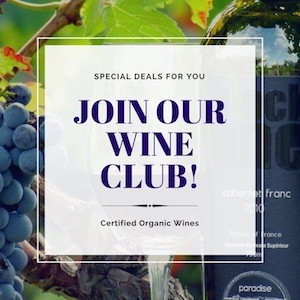 The Dados family were our westerly neighbours separated by a 50 year old block of vines, living in the old Hourcat farmhouse – the oldest property in the hamlet. The view from the Paradise Rescued winery across the old and new Merlot vineyards towards the old Hourcat farmhouse. Monsieur was a fourth generation farmer / vigneron on his land. The block of vines between us had been replanted in 1957 following the mega frost a year earlier. 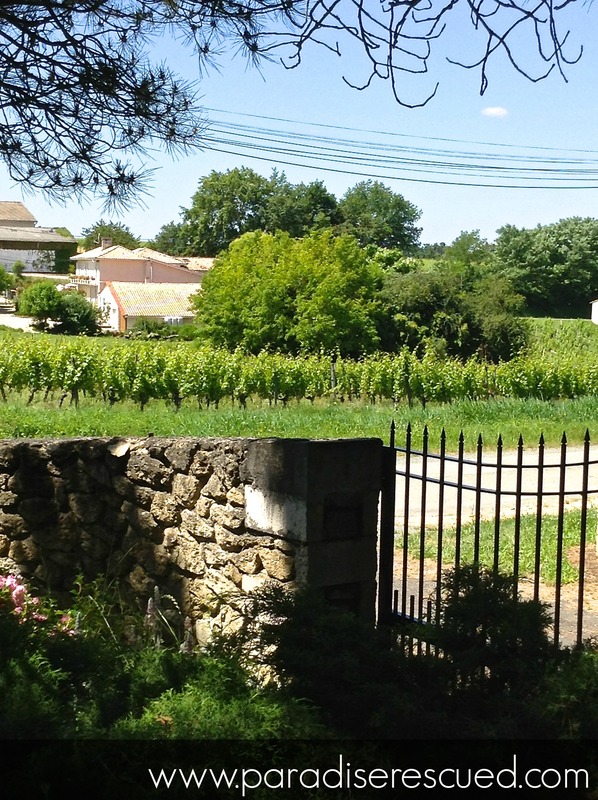 Since retirement, this old vine block of vines had been rented out to the local “big commercial chateau”. His love and care had been replaced by more machinery and an increased level of chemical management. I was just glad to be “home” and on holiday in Cardan but I was about to get a full local village news update on what I had missed in the 11 months that I had been away. As I appreciated the Dados family hospitality over a very large couple of glasses of home made ‘pineau’ (grape juice and eau de vie), the news wasn’t pretty. A housing development tsunami was about to get under way. Our village was changing. The possibility was there that its heritage and viticultural history might disappear under the shadow of its 12th century church as our local rural community watched on – powerless to stop it. The Cabernet Franc vineyard from the front gate of the property today. The vineyard village heritage continues. Our neighbours to the east of our property were downsizing and sub-dividing. Hence the possibility of the three houses on the adjacent land which, despite a small laneway in between, would easily be able to overlook our rural property. We bought the land. Just prior to the final local legal settlement of the purchase contract, the vendor and I carried out a quick final property inspection. The vendors and their extended family were leaders in the community and wanted to make sure that everything was carried out professionally. The last part of the process involved a joint check reading of the water meter to that property. As we completed the check, the vendor asked what I was planning to do with my new property purchase. 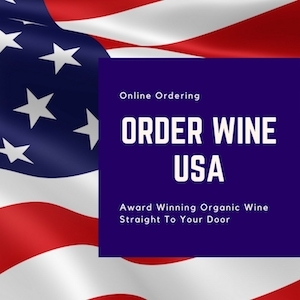 I must have looked confused by the question – beyond my lack of French comprehension – as he continued with his line of thought and questioning. 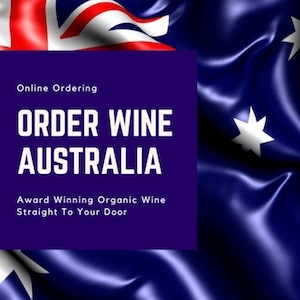 “Can I advise you David” he continued, “make a good job of what you decide to do here because, when you come back in twelve months time, there will be six new houses on the vineyard block outside your front gate”. This potential new development would effectively completely ruin the rural nature of this part of the village and block our neighbours’ direct line of sight to the 12th century church. When the sun sets behind the church, it is an unbelievable sight. And a privilege to witness it. The moment had arrived. It was time to decide whether to shut up (and leave) or put up (and get serious). That Rubicon River moment had arrived. We decided. We crossed. 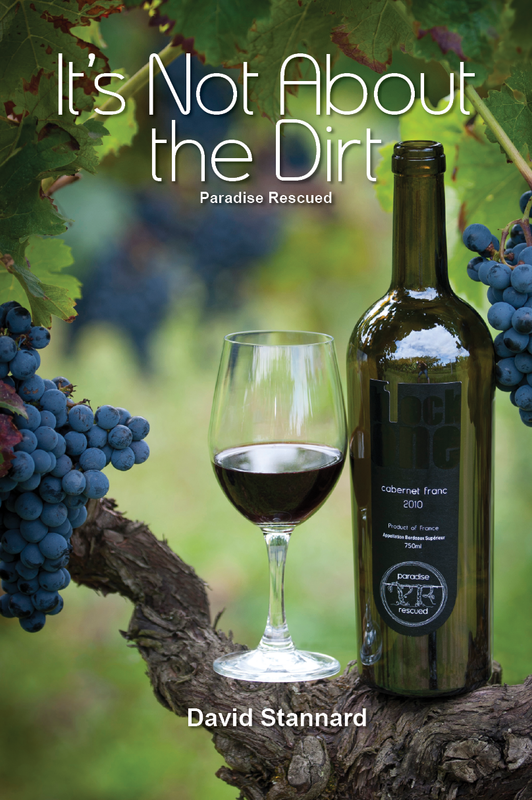 Paradise Rescued was born and our Sustainability Mission defined. A brand is the story telling of an organization. This is how our brand and organization started. Sunset from behind our Cardan 12th century church. 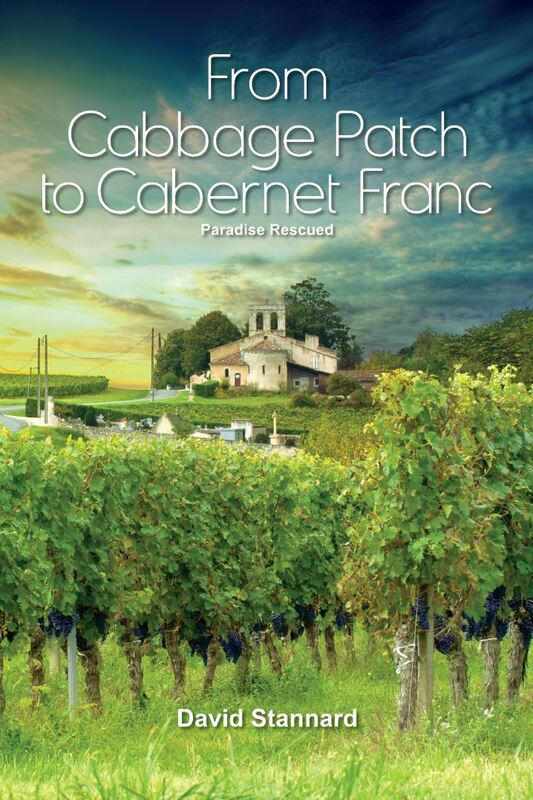 The vineyard block overlooked by the old church is now home to our 100% Bordeaux Cabernet Franc – one of just a handful of full varietal CabFranc’s in the region. The block between Monsieur Dados and ourselves was finally purchased a bit later. The Old Block Merlot vines are now 60 years old and with loving hands-on care from our team, they are producing amazing Merlot wine and watching the growth of a fully renovated vineyard block alongside them. A tradition has been continued, a village heritage sustained and a new legacy begun. 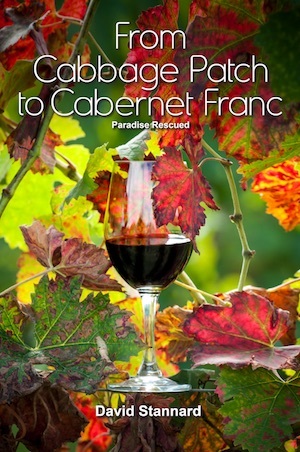 Read more of the story that created brand Paradise Rescued in David Stannard’s books “From Cabbage Patch Patch to Cabernet Franc” and “It’s Not About the Dirt”. Join Club Paradise Rescued and follow / support our progress. Paradise Rescued is the 2016 Silver Stevie International Business Award winner for Small Budget Marketing Campaign.